With the new forum server update, the picture server has also been upgraded. Here's the new procedure. 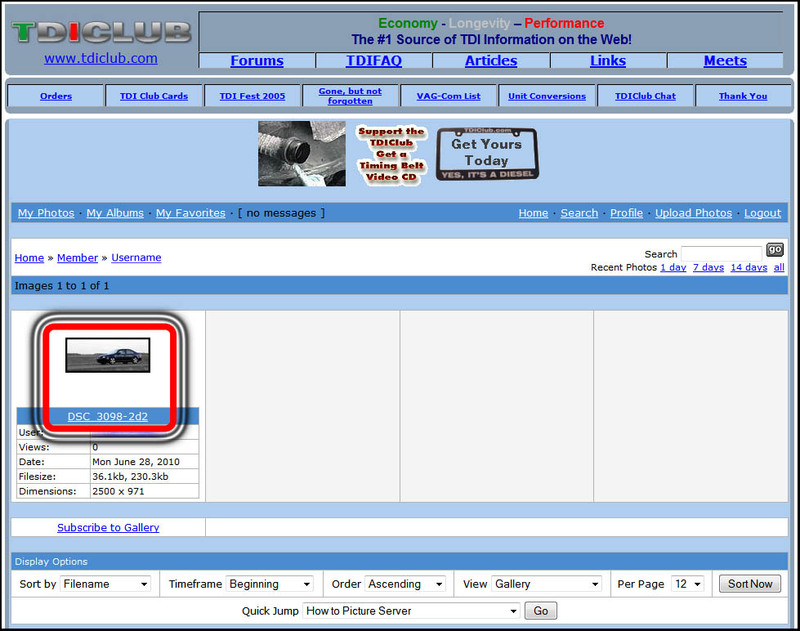 To insert images in a post, you can use different services such as Photobucket, Picasa, Flickr and others but the advantage of using the TDIClub picture server is that your photos will always stay online in your posts. Pictures showed as a link to another website have the risk of being deleted or the link can sometimes change resulting in a missing picture in your message. That is particularly bad when the images are in a important reference post like a "how to". 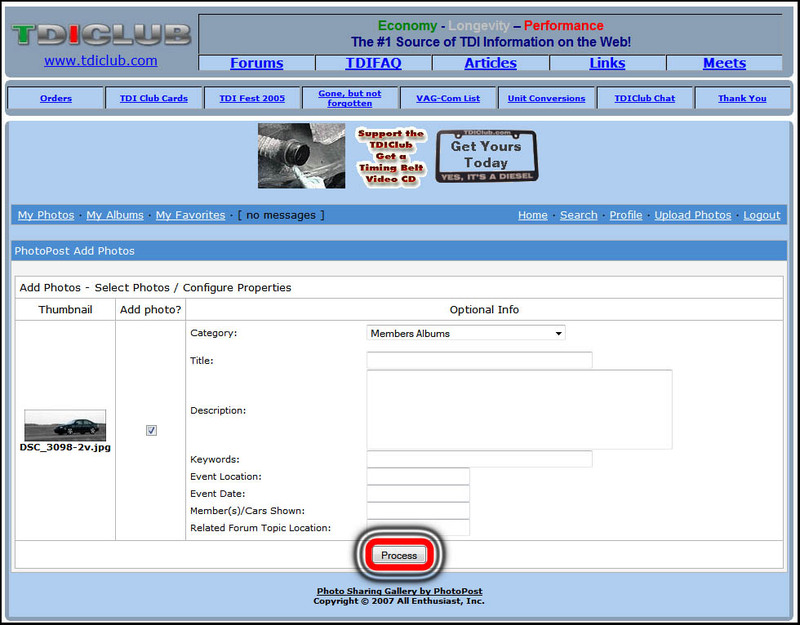 Even better, your account on the picture server is already created using your forum identifications informations. 1. 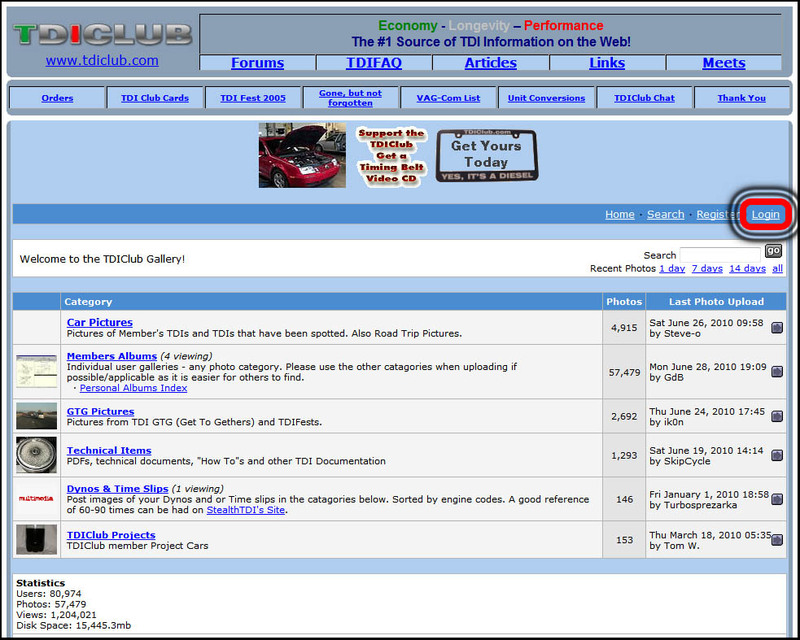 Access the server by the link pics.tdiclub.com or by clicking the "Photos" link into the forum's header. 2. 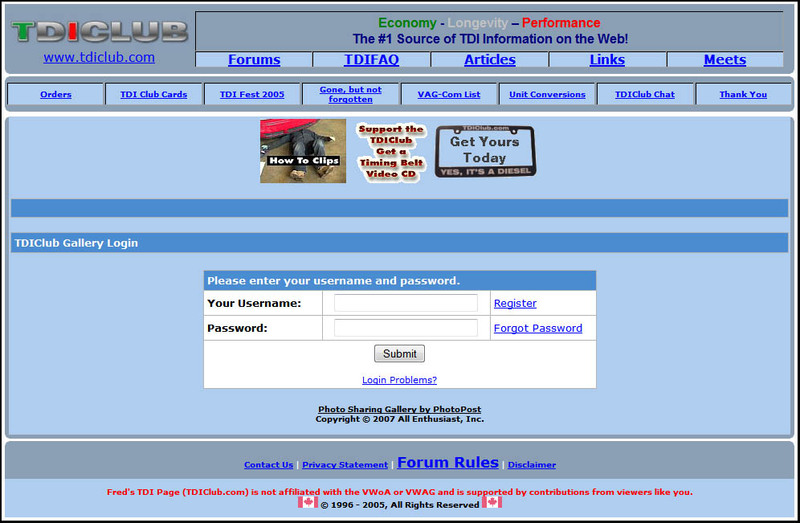 If you are not already logged in, you need to do it by clicking on "Login". 3. 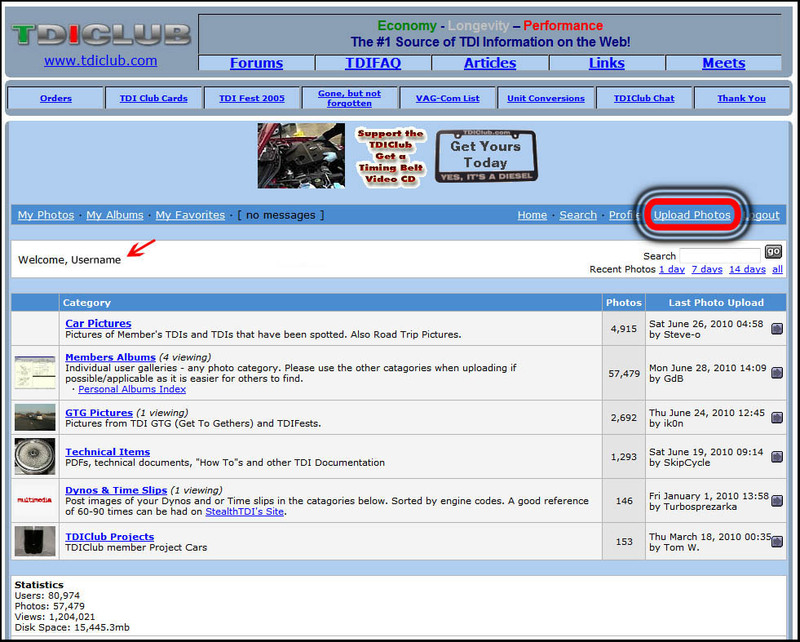 Login using the login informations of the TDIClub forum. 4. Once connected, your username will be shown. 5. 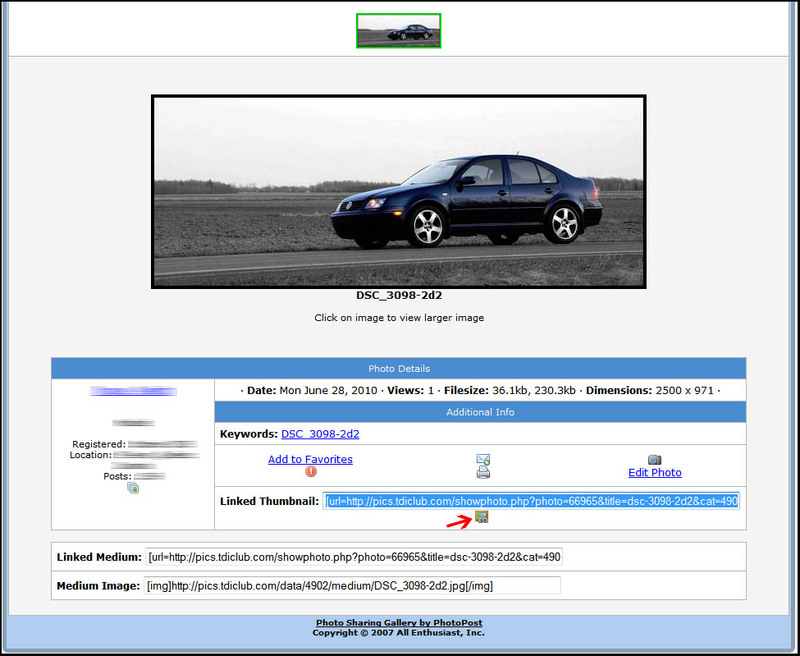 Select the file from your computer using the Browse button and then click "Upload/Submit". 6. 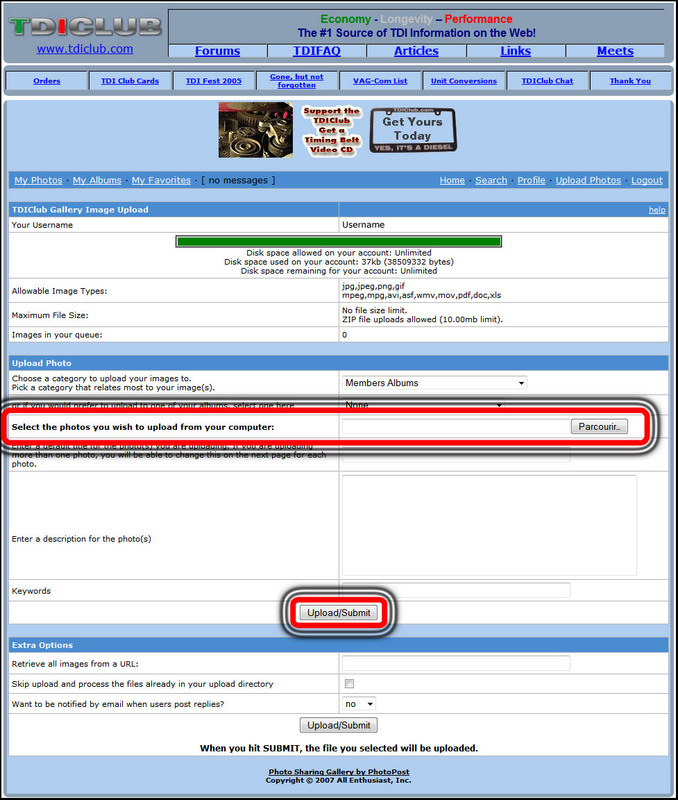 You can now add some optional informations about your image. 7. Your photo will now be shown in your personal folder. 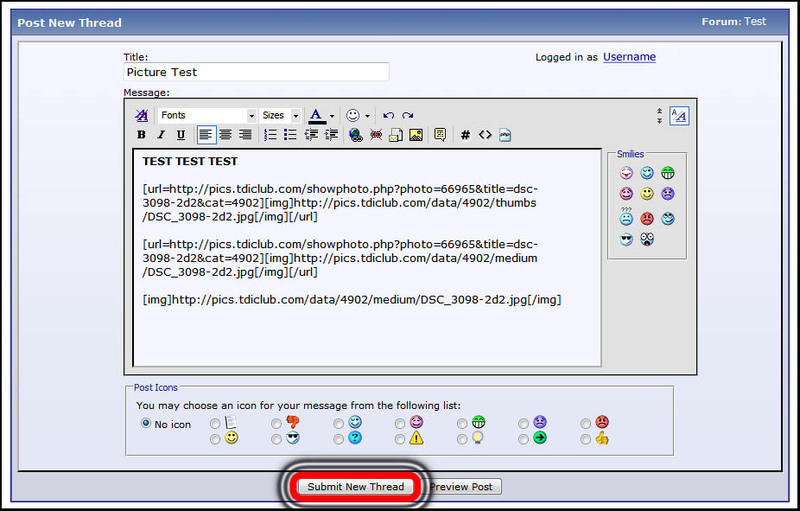 a) To insert a small sized image which is a link to the big image in your personal folder : Select the address "Linked Thumbnail" and copy it (CTRL-C). For the other choices, click on the icon next to the previous link. b) To insert a medium sized image which will be a link to this image in your photo folder : Select the address "Linked Medium" and copy it (CTRL-C). 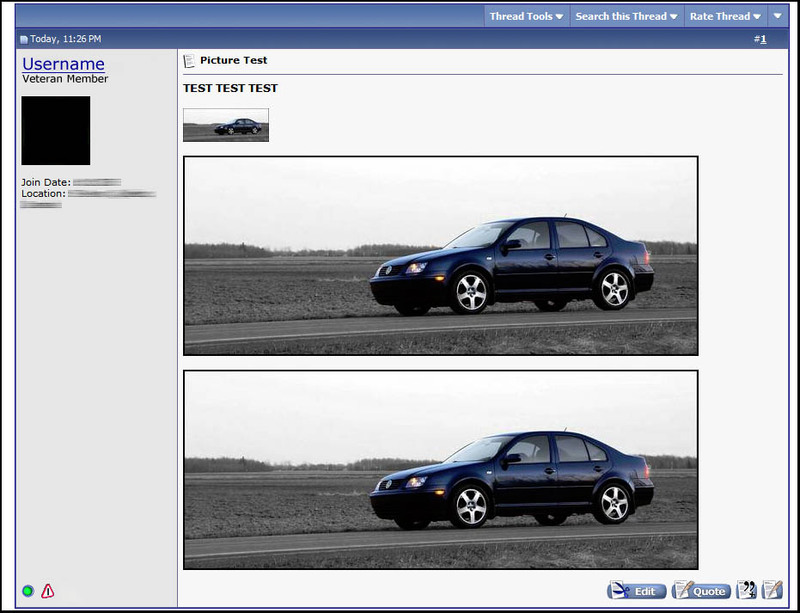 c) To insert a medium sized image only : Select the address "Medium Image" and copy it (CTRL-C). 9. Now go back to your already started post or start a new post/thread. Paste (CTRL-V) the address you just copied in your message. I decided to paste the 3 links to show you the difference it makes. 10. Here's the result ! You can also upload some small videos, PDF documents, Word and Excel files and insert them into your message the same way you would do it for an image with the "Linked Thumbnail" link. This "How to" isn't explaining every aspects of the picture server but is you have any questions, just ask. English not being my primary language, if something is wrong, please tell me. Things haven't been the same since the forum was upgraded. Even though it says "click on photo to make larger (or smaller)", it doesn't work...nothing happens. I told Fred about that Larger image issue, he will fix that soon. The little icon should be at the right hand side of the "linked thumbnail" address of under it like I posted. The other links will appear when you find/click on that icon. Jetta TDI 2001 GL (~680 000 km) : GT-1749VB, EGT/O2/Boost Gauges, Scangauge II, Sachs VR6 Clutch kit, OEM G60 Flywheel, 502 Nozzles, MRTuning, Euroswitch, Hella Micro-DE w/ yellow bulb, Rear fog, Wolfsburg's Heated Seats, Koni STR.T Shocks, H&R OE Sport Springs, TT Control Arm Bushings, 17" Santa Monica (GTI VR6) Wheels, DieselGeek Skid Plate, FX35 HID Projectors Retrofit, GLI Tail Lights, 2004 Trunk lid. OK, I'll try that. Maybe I need to find larger pictures. We used to see links defined by the picture's size that you could click. No we just see the file size and the hyperlink(s) is gone. Last edited by dieseldorf; July 1st, 2010 at 11:16. Well, I tried to upload and paste a pdf file and the above is what I got. Is something wrong here? Thanks for doing this Torque_Delight. It is some great work and I'm sure it will help the rest of the members significantly. Under the old implementation I had done a number of customizations and it is apparent I'll need to do some additional tweaking to this update as well. If there are any other issues/problems with the pics section, please post in a separate thread so we can keep this one just for the how-to. Can you upload more than one picture at a time ? Well if you read the text on the upload page it keeps refering to pictures as PhotoS. Strange. Well I did read the text on the upload page several times and did notice it say photoS but couldn't figure out how to upload several at once. Does anyone know if you can you upload more than one picture at a time ? I simply use MSO 2003 w/ 2007 upgarde to re-size a large picture to a web size. I agree. Let me see what I can do/if there is any potential for that. To resize pictures just upload the full size version. The picture server will automatically keep a copy of the full size image as well as make a medium sized version which is fine of the forums and an thumbnail. It is now possible to upload five non multi media files at a time now. Hey, what he said is KEY. You can't upload photos that you have downsized if you still want to be able to show the 'medium' size in your thread. There is some minimum picture size threshold that once your photo is below it (like if you shrink the size before you upload), the little icon next to 'linked thumbnail' won't appear as an option, then you're stuck with only uploading the thumbnail link in your thread. Long story short, upload full sized photos -- funny since I shrink them to save space on the server!